Gemma doesn't believe a chicken could have written a book - chickens can't even read! But here in front of them is The True Story of Harrowing Farm , and its scratch pages definitely look, well, chickeny. "a clever and biting social fable ... wit and brilliance sparkle on every page." 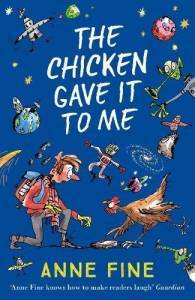 The chicken gave it to me is a book for children in the middle age range; it was first published in 1992, and has twice been reissued by Egmont, most recently in August 2018. 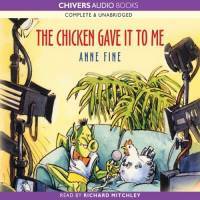 Order The chicken gave it to me in paperback from Amazon, or from any bookshop or library (ISBN: 978-1-4052-8902-3). It is available as an unabridged audio book, read by Richard Mitchley (ISBN: 978-0-7451-2437-7) as an audio download from Amazon / Audible.com. Anne has also turned this story into a play, under the title Celebrity Chicken , published by Longman. This is now out of print.